This post, A Lot at Stake: Amicus Filers 2017/2018, by Dr. Adam Feldman, first appeared on January 16, 2018 6:48 pm at https://empiricalscotus.com/. Whether they know it or not, large sectors of the population have interests in the outcomes of Supreme Court cases. With cases dealing with issues ranging from voting rights to owner’s rights in retail sales, many people are affected outside of the immediate parties to each case. These diverse interests along with more specific interests from regular Supreme Court filers have led to the uptick in the number of amicus filings over the years. Now, there are few cases without amicus filings and many cases have cumulative filings that total in the double digits. For cases that have been or will be argued between the October and February sittings this term, groups have already filed 529 amicus briefs on the merits with still more filings to come for the February arguments. With all the potential variety in amicus briefs, it may or many not be surprising that certain routine filers still direct most of the Court’s attention. 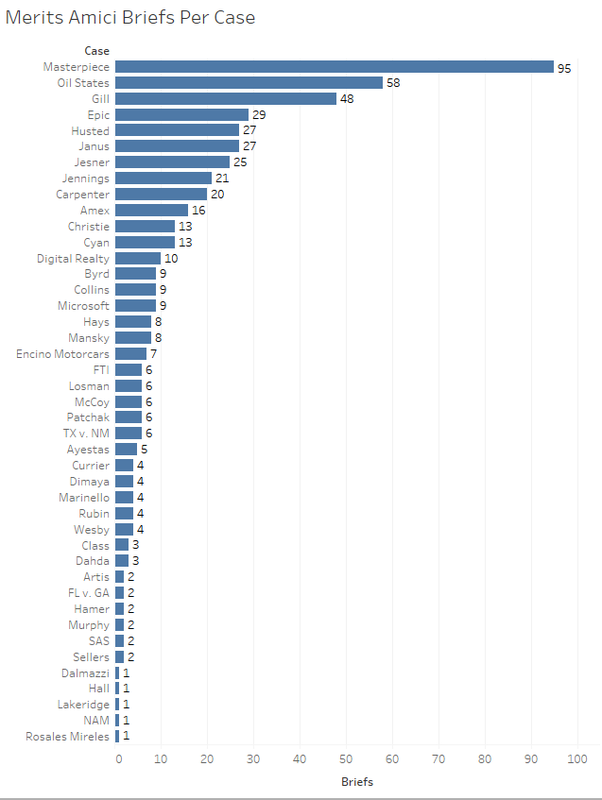 The sheer number of amicus briefs filed each year necessitates a means to quickly ascertain which amicus briefs and specifically what information within those briefs will aid the Court in its deliberations (in a recent paper, my co-author and I developed an automated method for clerks to locate unique information in amicus briefs). A set of groups that regularly file such briefs on behalf of specific interests tend to garner the Court’s attention. These briefs come with the expectation of high quality writing and high information value. As is apparent in the chart below there is no shortage of groups that filed at least four amicus briefs on the merits through the February arguments. Note: Group names were aggregated based on the first named group on the brief. The top filer, the United States, almost always leads the way in number of amicus filings. The justices tend to place high regard on information conveyed by the United States through the Office of the Solicitor General (OSG). Representatives from the OSG also often participate in oral arguments. As an aside, this term is actually the first time in recent history where the Court accepted a request from a law processor to argue as an amicus. Other groups on this chart with multiple filings are all regulars to the Court. The group with the second most filings so far this year, the NACDL, is also routinely one of the most effective filers. Rounding out the groups with the most merits filings so far this term – the Cato Institute, ACLU, U.S. Chamber of Commerce, and the ABA – are groups that have each filed hundreds of briefs over their lifespans. We tend to see two main attorney types on these regular filers’ briefs. Many groups have their own in-house counsel that write multiple briefs a year. Even with such attorneys, these groups often farm out brief authorship to private law firms that have regular exposure to the Supreme Court. The following chart is based on the authorship of briefs from this subset of groups. The Cato Institute’s Ilya Shapiro, for instance is the counsel of record on five of the group’s eight merits amicus briefs filed so far this term. Several of the top Supreme Court repeat players from private practice authored amicus briefs for these groups as well. One such individual, Mayer Brown’s Andrew Pincus, authored three briefs – each for a different group (one for the Cato Institute, one for the Chamber of Commerce, and one for the ACLU). Others on this list include O’Melveny & Myers’ Jonathan Hacker, Jenner & Block’s Jessica Ring Amunson, Ropes and Gray’s Douglas Hallward-Driemeier, and Skadden Arps’ Clifford Sloan. The gravity of these briefs and the importance for the respective groups becomes apparent when one takes into account the amount of money each of these attorneys and their respective practices command on an hourly basis. Cases that garner many amicus briefs tend to interest large swaths of the general population. The cases so far this term are no different. The case with the most filings this term, Masterpiece Cakeshop, is likely the case most discussed so far in the national media. Oil States affects the future of patent litigation and consequently the allocation of billions of dollars. Gill v. Whitford was the first of several voting rights cases that the Court will hear this term that very well may affect the design of voting districts moving forward. Suffice it to say there is no shortage of importance in the Court’s cases and no shortage of amicus filers. Since the Court is moving at a historically slow pace in releasing opinions this term there are few means to gauge the efficacy of the term’s merits amicus filings. The justices have primarily stayed away from direct references to specific amicus briefs in oral arguments. Justice Sotomayor is the justice to make the most direct references to amicus briefs so far this term with three. Such references are good indicators of a brief’s effectiveness as they show that at least someone in the justice’s chambers reviewed the brief and found the information sufficiently pertinent to probe a bit deeper. Here, Justice Sotomayor was likely referring to the brief from Alliacense Limited LLC when she described petitioner’s “strongest amici” as Alliacense’s brief contained a substantial history of the Privy Council’s patent adjudication. While divining the few cases from the thousands of petitions that the Court will grant each term is an inexact and unpredictable science, several aspects of the Court’s cases are quite routine. Even as the Court takes fewer cases each term, a regular group of amici, each with strong interests, files briefs in multiple cases. The authors of these briefs tend to be Supreme Court repeat players with extensive amicus experience. 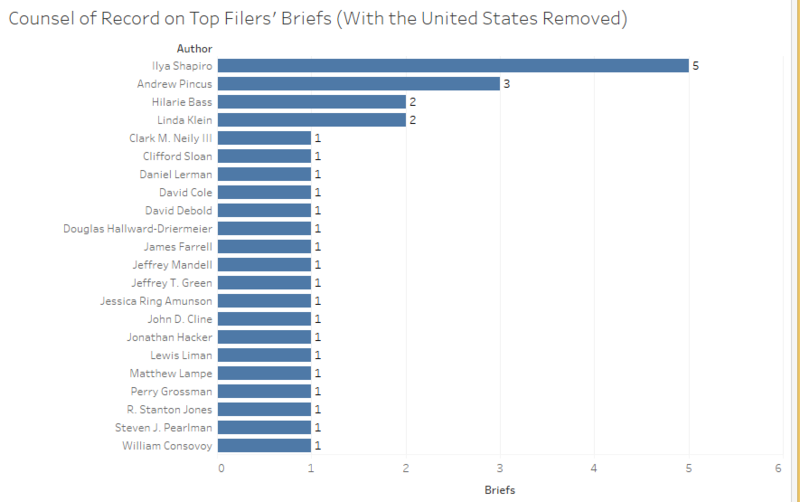 While we alreadt know about many of the filers for this term’s amicus briefs, we will not know much about the impact of these briefs until the Court releases more opinions.